“Berlin is a wonderful opportunity, could you possibly steal 500 Marks and come over? Everything here is full of tastelessness, but with such magnitude, my friend!” The young Bertolt Brecht wrote these words to his friend Caspar Neher in Augsburg on that cold day in February of 1920. Shortly after his 22nd birthday, Brecht traveled for the first time to the capital. He was literally overwhelmed by the masses of people, by the underground railway, the department stores, the cultural life. “This scam named Berlin is different from all other scams because of its shameless grandiosity. The theaters are wonderful here: they give birth to little bladder stones with such an entrancing ardor. I love Berlin, although with limited liability”. Croaking on the guitar some saucy verses for his friends, Brecht wrote little plays and wanted to work in theater. Together with his school friend (later his stage designer) Caspar Neher, he was determined to write theater history. But conquering Berlin was no easy task, there were simply too many young people out there who considered themselves to be artistic geniuses. Until 1926, Brecht traveled to Berlin on nine different occasions for longer periods of time. He was eager to establish contacts. At long last, a director friend found him a job as a dramatic advisor at the Deutsches Theater and actress Helene Weigel, who would later become his wife, left him her Berlin apartment. The rest can be read in school books. In Berlin, Brecht became one of the 20th Century’s most important theater personalities as a playwright and director, and celebrated a sensational success in 1929 with the “Three-penny opera”. At the same time, he also wrote for newspapers, produced the first proletarian sound film with friends and worked with musicians as well. Nowadays, he would probably be considered a multi-media, multi-tasking genius who experiments with all sorts of materials and styles. Brecht aspired to change society; he became a communist and was forced to flee from the Nazis in 1933. Fifteen years later, he returned to the city “that makes you smart” and together with Helene Weigel, he built up the internationally renowned Berliner Ensemble until his death in 1956. Brecht’s last residence, his apartment on Chausseestr. 125, is now a museum. His grave in the Dorotheenstädtischer Friedhof has become a place of pilgrimage. 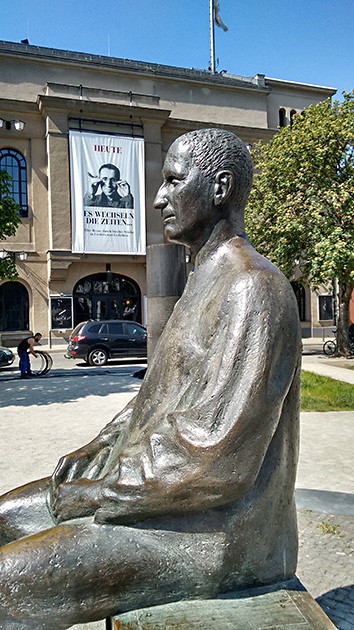 The poet now sits as a bronze statue in front of his Berliner Ensemble and the square bears his name. Sometimes children like to use the monument as a jungle gym. In the theater next door, the “Three-penny opera” has been going strong for the past 12 years under American director Robert Wilson, and Brecht’s piece “The Resistable Rise of Arturo Ui” has seen its rendition by Heiner Müller endure for over 20 years and 400 performances. Oliver Reese, the acting director since 2017, has also enriched their repertoire with remarkable Brecht plays: “The Caucasian Chalk Circle” in Michael Thalheimer’s production proves to be a highly topical piece about war and the fate of refugees, and Frank Castorf’s six-hour “Galileo” treatment urgently questions who actually benefits from the inventions of scientists. Berlin has changed a lot since Brecht’s days, but the irresistible fascination it is exercising on artists and creative free spirits has in no way diminished. They don’t come flocking only from the provinces anymore. In the last few years, there has been a considerable number of artists represented in the big modern art exhibitions worldwide who have established their studio in Berlin but originate from foreign countries: the Icelandic installation and light artist Olafur Eliasson ran the “Institute for spatial experiments” from 2009 to 2014, and his Chinese colleague Ai Weiwei taught at the Universität der Künste from 2015 until 2018. Considered undesirable in his native China, he continues to travel the world while retaining his big studio in Berlin. In addition to an active and vibrant cultural life, there are also rather mundane reasons for the city’s irresistible appeal: compared to other capitals, you can still live in Berlin on a relatively small budget. There is also a multitude of cultural programs benefiting immigrant artists as well. What makes Berlin exceptionally stimulating is its messiness and utter roughness. The historic fractures and the social distortions lie there, close to the visible surface. “A training camp for the unprejudiced eye”, that’s how the former Festspiele festival’s artistic director Ulrich Eckhardt named the city, and even “a transit station for expeditions into uncertainty”. In Berlin, tens of thousands are struggling as painters, sculptors, multi-media artists, actors, directors, filmmakers, musicians, dancers, architects. Most of them are living at or below poverty level. For this reason, the “Koalition der Freien Szene” (Coalition of the Independent Scene) was formed in 2012 to demand fairer distribution of subsidies allotted to culture. Of the 450 million plus euros Berlin spends on culture each year, 90% is allocated to established institutions where roughly 2,000 people are employed. It is estimated that roughly 10 times as many artists are scraping for the pathetic subsidy crumbs and for whatever they can get from the stingy commercial media outlets and the cut-throat art market. The Free Scene Coalition has accomplished some improvements, for example, that minimum fees have to be paid when the Senate sponsors a project. More money is flowing into the independent scene, but not nearly enough. And for low-income artists, it’s becoming increasingly difficult to access apartments, studios and rehearsal rooms. Berlin is currently growing by at least 20,000 inhabitants per year and housing construction is not keeping up with demand. This leads to sharp increases in the costs of rent and living. The scarce living space has become a popular investment opportunity for speculators from all over the world. Free space for non-conforming artists is drying up while the influx of monetary capital poses a real threat to the Berlin’s creative appeal. A brilliant career like Brecht’s is achieved only by a few creative minds. However, the city benefits also from the ones who don’t succeed in finding fame and fortune in the beaming limelight. The fact that the creative community remains Berlin’s most valuable asset is no longer up for discussion among politicians. The city is still hurting economically from its decades lasting division, from the departure of many West Berliner companies after the Wall was erected, and from the industrial collapse in the East after the Wall fell. But as a culture and science hub, Berlin can compete with Paris, London or New York and continues to attract a bevy of companies and start-ups. Not to mention the tourists, 45% of which are traveling from abroad. Their numbers have doubled over the last ten years. No one knows the exact number – official statistics only state that there are more than 31 million overnight stays per year. During the 19th and 20th century, bohemian free-spirited artists got together in salons, bars and cafés, a few places even became legendary locations, such as “Café des Westens” around 1900 and the “Romanische Café” during the roaring 20’s. Both of these cafés on Kurfürstendamm don’t exist any more. Authentic locations that have survived include the Zwiebelfisch at Savigny Platz – for those older ’68 generation gentlemen – and the somewhat proletarian Kaffee Burger on Torstraße, which has provided good vibes for over 20 years with its readings, concerts and ­Russian Pop dance evenings. Artists were looking around those places to find their very own niche. As a result, until 1933, there was a close-knit network of artist spots around Kurfürstendamm. It was called “The industrial area of Intelligence”. The universities served as central places for intellectual and political confrontations for the rebellious students in West-Berlin of the 60’s and 70’s. From there, they practically conquered the streets. In the 80’s and early 90’s, young non-conformists were squatting empty old apartments (in the East mostly in Prenzlauer Berg) and entire houses (in the West mostly in Kreuzberg), where they organized punk concerts, performances, readings and exhibitions. Alternative cultural centers such as the Mehringhof, the Kulturbrauerei, and the Pfefferberg are remnants of this era. The internationally known art center “Tacheles” on Oranienburger Straße finally closed shop for good in 2012. Eviction also loomed over the Schokoladen, on Ackerstraße, but the property was surprisingly purchased by a Swiss foundation in March 2012, and has since kept the cultural center afloat. Nowadays, the younger creative crowd is networking via the Internet and cellular phones; they depend less on a previously determined meeting point. A few well-targeted text messages on whatsapp or a facebook post will guide the party-­goers to a new club, an insider party in an empty shed or cellar, even to some savings bank’s lobby for a spontaneous illegal party. Just a couple of years ago, those so-called nerds with thick glasses and laptops used to be described as “the new digital bohemia”. Today, the smartphone has become a standard accessory for the average Berliner, whether young or old. Coinciding with these developments is a new dawn for entrepreneurial activity. Berlin enjoys its reputation as the new Mecca of internet startups, also being dubbed the European “Silicon Valley”. What the “Café des Westens” represented for the creative scene 100 years ago can now be found at Sankt Oberholz at Rosenthaler Platz: the start-ups scene’s market for ideas and networking complimented by guest apartments and a co-working space to plug and play. This model has quickly caught on and even urban housing associations are planning to build micro-apartments and “spacelabs” for urban living. Nevertheless, artists still need locations to be able to develop creative projects which they can introduce to the broader public, and this cannot be achieved merely on the face of a smartphone touchscreen. So now the connection between the artistic community and physical locations has blurred. It used to be easier to unmistakably associate certain locations with definite artistic personalities, groups, trends or positions. In the 70’s, the Theater at Hallesches Ufer was considered the legitimate stage of director Peter Stein and his young Schaubühne-ensemble. Since 2004, it has been named HAU. Together with the 100-year old Hebbel Theater, its become one of the most important venues for theater in all of Europe – doing so without its own actors’ ensemble. Free theater groups from Berlin and all over the world have passed the baton to one another here. Shooting stars from the German theater world − such as the directors of the “Rimini Protokoll” who cast their theater evening performances with “routine experts” instead of professional actors, feel better at the HAU than in more established and firmly structured theaters. It is essential that the doors remain wide-open and continue allowing theater producers in their mid-twenties to get their chance as well. A good example is the annual Festival “100° Berlin”: during an extended weekend, up to 120 Berlin theaters and performance groups perform non-stop every hour. Similar to HAU, the Sophiensaele in Mitte (since 1996) is another comparably successful springboard for artistic careers. Here the choreo­grapher Sasha Waltz became famous with her dance ensemble; then she went to work at the Schaubühne for a few years. After experiencing the rigidness of a more structured theater, she became independent again in 2005. As her base quarters for worldwide projects, she chose the Radialsystem V, an abandoned drainage pump station on the Spree riverbanks. Since its opening in September 2006, it has established itself as a “new space for the arts”, and as a location for production / performance allowing for cultural excess and exaggeration. Old and new music meet in the Radial system V with much experimentation and new concepts for concerts that combine music, dialog and dance. The concept of the house has been so successful that the Senate plans to purchase in order to secure it permanently as a cultural location. More popular and more commercial is the mixed program of music, theater and show at the Arena in Treptow, an old bus depot which has been offering a lot of space for all sorts of cultural events and fairs since 1995. It was such a resounding success that the operators at that time, including impresario Falk Walter, dared to reopen the old Admiralspalast (next to the railway station Friedrichstraße) with a production of Brecht’s Threepenny Opera, in which the Toten Hosen lead singer Campino would play Mack the Knife. International show productions gave guest performances in that amusement theater built before World War I. There are also smaller theater locations for chamber plays and youth theater productions, a club in the basement of the courtyard and a pub on the street front. The mixture must be just right and appeal to a broad audience in order for this cultural location to be financially self-sustaining. In 2010, the prodigious Falk Walter had to file bankruptcy for the “Arena” and the “Admiralspalast”, but the shows goes on, even without their Founder, at least in the the Admiralspalast. The popular cultural locations in Berlin seem to have a particular affinity with water. Back in 1920, you could swim around the clock in the Admiralspalast. Their competitor at Anhalter Bahnhof, the Tempodrom, offers the opportunity to splash in a Liquidrom. The Velodrom on Landsberger Allee, the largest event hall so far, is located under one roof with the most modern indoor swimming pool. The Badeschiff, which was part of the “arena” in Treptow, also offers open-air concerts for its guests in the summertime. Recently, an American investor built a well-equipped multi media sports and concert hall on the River Spree accommodating up to 17,000 spectators: what started as O2-World has been renamed Mercedes-Benz Arena Berlin since mid-2015. It has quickly established itself as a marquee venue for world-famous acts such as Madonna, Lady Gaga and Rihanna and serves as the stadium for the city’s beloved “Berliner Eisbären” hockey team as well as the “Alba Berlin” Basketball team. Just like the Haus der Kulturen der Welt, the former congress hall in Tiergarten, the Mercedes-Benz arena can also boast a private dock for ships. In the last ten years, a completely new district has emerged surrounding the sports and cultural hall. The Haus der Kulturen der Welt (House of World Cultures) was conceived as a result of the “Horizonte Festival” of the Berliner Festspiele. The emphasis is on non-European countries and migrants from all over the world. This place broadens and rectifies our views on foreign cultures, the way we know them from the media or from the international art and music market. The initial impulse of exhibiting other cultures in a display window has evolved in recent years; instead they are provided with an open platform and the necessary tools for promoting an international network. Foreign curators shape entire series of events and the invited artists often create completely new works for their performances in Berlin. Nevertheless, artists from immigrant families who grew up in Germany were somehow missing a theater they could call their own. Since 2008, resident artistic director Shermin Langhoff has made the old Ballhaus Naunynstraße in Kreuzberg a forum for the post-immigration cultural scene. She’s continued with this concept during her tenure, teaming up with dramaturge Jens Hillje at the more financially robust Maxim-Gorki-Theater since Fall of 2013: together with a diverse ethnic array of actors, authors and directors who draw from their “migrant backgrounds”. This city theater’s long overdue recognition that Germany is a nation of immigration has been received well by audiences and critics alike: in 2014, theater critics hailed the Maxim-Gorki-Theater “Theater of the Year”, and in 2016, the theater directors were awarded the Theaterpreis Berlin. Just as it is the case for the event locations, it has become increasingly difficult to get a grasp on the multitude of International Culture Festivals taking place in Berlin. Before the fall of the Berlin Wall, the most important event promoter in West Berlin was the Berliner Festspiele. Meanwhile, a multitude of different festivals have emerged, prompting the Festspiele organization to move into its own quarters (in 2001) in order to remain visible and distinguishable from the rest. In the former “Freie Volksbühne”, there is enough space, not only for the annual theater-get-togethers to which they invite the season’s ten most remarkable productions, but also for the JazzFest, the avantgarde “Maerzmusik” and the “Internationale Literaturfest”. Budding artists from all over Germany, aged between 10 and 21 years, are invited to the Festspiele’s annual “Theater­treffen der Jugend” (youth theater get-together), “Treffen junge Musik-Szene” (youth music get-together) and “Treffen junger Autor*innen” (youth literature get-together). In 2012, the author and dramturgist Thomas Oberender (born in 1966) took over the direction of the Berliner Festspiele, which he has made even more conducive to experimental theater. The most charismatic festival of all is the Berlinale, where during a two week span 400 new films are presented to nearly 500,000 spectators. More suspenseful than the competition itself or the glamour surrounding the festival, are the “little gems” in the “Forum” and other sections. A large number of films shown there will probably never find their way into German distribution. For some the “Berlinale” is a great springboard, giving them the chance of a lifetime. Setting itself apart from the major film festivals in Cannes and Venice, the Berlinale is a film festival catering to the ordinary moviegoer by incorporating smaller cinema venues in the outskirts. One of the biggest festivals for digital arts and culture worldwide is the CTM Festival, which was founded in 1988 under the name “VideoFest” within the Berlinale. As an extension thereto, a forum for electronic music was created in 1999: the “Club Transmediale” – hence the acronym CTM.Festivals have the benefit of inciting the audience and the press to focus their attention on a specific artistic field for a short period of time. However, if you look at the movie programs and event calendars, it becomes apparent that even an everyday basis, Berlin often boasts more culture than most prestigious film, music or literature festivals. Others cities would be delighted if they even had one literature house where literary readings would be regularly held. Berlin has a total of five! Since 1963, the Literarisches Colloquium has been residing in a villa in Wannsee, promoting young authors and translators, and producing the literature access portal for the Berlin and Brandenburg region on the internet (www.literaturport.de). Since 1986, the Literaturhaus is located on a side street of the Kurfürstendamm, right in the middle of the former “Industrial area for Intelligence”. It has plenty of space for literary exhibitions and as of 2018, a new female director has increased their appeal to a younger audience. New formats also include events for children and families. Compared to earlier years, the Literaturforum at the Brecht House focuses less on authors with an East German background and is presently offering the most diversified program of lectures and book presentations. LesArt is devoted to children and youth literature and works together with school classes. In the past years, the former LiteraturWERKstatt in the “Kulturbrauerei” had the keenest intuition for discovering new literary trends. The “open mike” was created as one of the most significant newcomers’ talent competitions, introducing the international “Poetry festival” and the “lyrikline” to the internet, a database with a number of poets’ voices far in excess of 1300 in a total of 84 languages. In 2016, the “literaturWERKstatt” became the Haus für Poesie (House of Poetry) in order to enhance their profile. Meanwhile, literature houses are commonplace throughout Germany, however, a house purely dedicated to poetry did not previously exist. Aside from literature houses, bookstores and libraries, various literary stages have been enriching the literary scene since the turn of the century – such as the “Brauseboys” or the “Surfpoeten”. There’s a different one, sometimes even several, taking place every day of the week. About 160 mostly smaller publishing firms call Berlin their home, although the city has not been able to reclaim its former leadership in the German book market. Economically speaking, Munich still remains the market’s leader. But this doesn’t prevent the authors from moving to the city on the Spree river. Significant literary publishing houses are following them. After Ullstein or Matthes & Seitz, the Frankfurter Suhrkamp publishing house, who used to be of utmost importance to the former Federal Republic’s intellectual life, has also moved its headquarters to Berlin, the literature capital. In 2019 they moved into a new publishing house near the Volksbühne. While large bookstore chains had to reduce their retail space in years past, countless new neighborhood local bookstores have opened attracting a number of loyal neighborhood customers thanks to an exquisite selection of books and top-class events and lectures. The Berlin Philharmonic Orchestra is a Republic of sorts: the musicians elect their chief conductor and together they decide who will be invited to join the orchestra, which guest conductor gets to wave their baton and which pieces will be played. While the Berliner Staatskapelle under the direction of Daniel Barenboim can look back on a long tradition as a “Hoforchester” (Royal Court Orchestra), the Philharmonic Orchestra is the product of a big metropolis’ concert house. In 1882, fifty musicians working under poor conditions rebelled against their Orchestra director Benjamin Bilse and became independent as the “Berliner Philharmonisches Orchester”. For decades they have been considered to be one of the finest orchestras, defending their outstanding reputation with fervent discipline and hard work without ever resting on their laurels. After Herbert von Karajan and Claudio Abado, they elected the youthful Sir Simon Rattle as their chief conductor in 1999. Aside from routine concert commitments, it was a matter close to the heart of this chief conductor to bring young Berliners and the musicians together, particularly those youngsters who otherwise would never have had access to their music. He initiated an “education program” where the Philharmonic and school pupils would work together, preparing and staging musical performances. In 2003, they played Stravinsky’s “Sacre du Printemps” to a dance performance in the Arena with 250 Berlin school pupils from 25 different nations. Their multiple-award-winning film “Rhythm Is It!” perfectly illustrates how this experience has positively changed the lives of many of the participants. Other comparable projects followed. Over the past several years this top orchestra has gotten much younger and displays an openness towards change in the media landscape as well as for technological innovation: the Berliner Philharmonic can be viewed and heard on the internet with the “Digital Concert Hall” either through a live stream or as a recording. The new, more introverted chief conductor Kirill Petrenko took over for Simon Rattle in 2018, assuming stewardship for one of the world’s premiere orchestras that has already made its mark in the new millennium. Next to the Philharmonic and the Staatskapelle, Berlin has a third world-class orchestra in the form of the Deutsches Symphonie­ Orchester. In 2017, Robin Ticciati, a young conductor from Britain, took up the baton and quickly felt at home in the Philharmonic. The Deutsche Symphonieorchester also strives to make classical music more accessible for young people with new concert formats. This attitude has paved the way for the Philharmonic’s Casual Concerts: shorter and more casual than usual, not to mention an aftershow-lounge where they can dance and relax. In the Berliner Philharmonie, designed by Hans Scharoun and inaugurated in 1963, the audience sits on terraces all around the concert podium, so the orchestra is placed in the very center. This architectural concept has enjoyed international acclaim. By 1984, East Berlin had rebuilt the Schauspielhaus at Gendarmenmarkt – which was destroyed during the war – thus creating the Konzert­haus with an opulent interior décor. Several concerts with different orchestras and ensembles take place in both houses, often at the same time on the same day. During the summer break, the festival “young.euro.classic” featuring the world’s best youth orchestras and newcomer soloists is firmly established in the Konzerthaus. To perform in front of the demanding and particularly critical Berlin audience is a crucial preparation for a future musical career, also for the students of the Universität der Künste and the music school “Hanns Eisler”. No other city can boast three big opera houses entirely financed by the municipality. The costs involved are taking a big bite out of the city’s cultural budget. Therefore, it has been repeatedly debated, whether Berlin could possibly afford three opera houses or if it would be preferable to close down one of them in order to increase the quality of the remaining two. However, no politician would be willing to confront the deluge of protests or face a possible loss of prestige for Berlin. Therefore, the three opera houses, the Staatsoper, Deutsche Oper and Komische Oper were united in 2004 into a common foundation to enable a more economical operation. All three houses have been representing different lines of tradition, which Berlin simply cannot shut down. The Staatsoper Unter den Linden, inaugurated in 1742 by Frederick the Great, is the oldest theater in Berlin. Their musical general director since 1992, Daniel Barenboim, is not only a conductor and pianist of international reputation, but is highly respected as a political personality as well. The fact that this musician with Russian-Jewish roots has had such a long-time commitment towards Berlin is seen as a symbol of reconciliation between Germans and Jews. After years of renovation work – which far exceeded its budget and completion date – the Staatskapelle returned to the Staatsoper Unter den Linden at the end of 2017. In a former scenery depot, Barenboim recently opened a new chamber music hall, the Pierre-Boulez-Saal. It’s part of the Barenboim-Said ­Akademie, where Arabic and Jewish music students share the classroom. The new hall allows for close proximity between musicians and listeners. In a very short time, they’ve attracted a regular audience that appreciates unusual concert formats. Reopened in 1947 in East Berlin, the Komische Oper is successfully defend­ing its reputation as an innovative house for analytical, socially critical music theater in German language and has been led by dynamic Aus­tral­ian director Barrie Kosky since 2012. This tradition was established under Walter Felsenstein, its general director until 1975. What’s important is not whether German is spoken, but that an everyday language is spoken. Now the Komische Oper is starting to face the fact that a massive part of the population doesn’t view German as its native language – there are now performances with Turkish subtitles and there will also be singing in other languages, when it makes sense for the production. For Barrie Kosky, the importance of the theater’s earnest Felsenstein tradition is equal to its prior history as a metropolitan theater; having a tradition as an operetta house and stage for lighter entertainment. As a direct result, the program is varied and every other show is sold-out. Music critics voted them “Opera House of the Year” in 2013, and in 2015, it received “the “Opera Company of the Year” award at the “International Opera Awards”. At the end of 2022, a five-year general refurbishment of the Komische Oper is set to commence, and the ensemble will perform at changing locations throughout the city. Felsenstein’s student, Götz Friedrich, went to West-Berlin and directed the Deutsche Oper for almost two decades until his death in 2000. Berlin’s largest opera house with 1800 seats was inaugurated in 1961. Since Friedrich’s death and under innumerous artistic directors and conductors, it hadn’t regained a clear and definitive direction. Incumbent artistic director and Basel’s Dietmar Schwarz has, together with the support of British general musical director Donald Runnicles, steered this ship back to its successful ways. The repertoire of all three opera houses consists mostly of pieces from the past. On the contrary, the long established Neuköllner Oper has been reinventing the music theater piece by piece, with material from the present and compositions oscillating freely between popular and art music. The Berlin audience has been known to be a difficult one to please, sophisticated and demanding even in the field of lighter entertainment. Those big organizers of musicals who in the past expected Berlin to be an easy and lucrative market where they could “dump” their pre-fabricated music theater productions had to experience numerous flops in past years. On the other hand, the Berlin ”homegrown” places like the Bar jeder Vernunft, the TIPI in Tiergarten or the just mentioned Neuköllner Oper have managed to conquer a faithful audience. Thanks to the many tourists visiting the city, some of the bigger houses have managed to establish themselves: Friedrichstadt-Palast, Admirals­palast, Blue Man Group and the impersonator-show Stars in ­Concert at the Estrel Festival Center. There is barely any other theater in Germany that made such an impression on newcomers and influenced their development to such an extent as the Volksbühne at Rosa-Luxem­burg-Platz. After 25 years, the style-defining director Frank Castorf had to hand over leadership. The resistance to his successor Chris Dercon was so fervent that he capitulated after just a few months. Dercon wasn’t from ensemble theater, but rather from the realm of visual and performance art, and so he radically changed the schedule and dissolved the old ensemble. The experiment failed leaving the future of the Volksbühne shrouded in uncertainty. And yet somehow the theater is very much alive thanks in no small part to transitional manager Klaus Dörr’s colorful drama plan garnering widespread adulation. So at least in the wake of the theater’s artistic collapse, a full-scale financial catastrophe could be averted. In 2017, the Berliner Ensemble experienced a similar fate when the senate forced a change of scenery after 18 years of artistic directorship under Claus Peymann. Unlike Dercon, the new artistic director, Oliver Reese, is a thespian through and through: playwright, dramaturge, director and artistic director in Frankfurt/Main. For him, the soul of a theater comes from the ensemble. For this new beginning, he’s already recruited a great bunch of experienced actors – and not to mention, the services of Volksbühne castoff, Castorf, as a guest director. The emphasis lies on contemporary drama and contemporary themes. Playwright Moritz Rinke heads an author’s workshop where writers can improve their craft by working closely with the actors themselves. The Berliner Ensemble is giving the Deutsches Theater a run for its money. Their current artistic director, Ulrich Khuon (since 2009), is also a proponent of contemporary drama and regularly hosts an Autorentheatertage (Playwrights’ Workshop) from his own house. Their mélange of contemporary classic productions and newer pieces, not to mention how they maintain a world-class ensemble isn’t lost on their audience. Much sought-after actors such as Ulrich Matthes or Corinna Harfouch enjoy working at the Deutsches Theater, which explains why the senate extended Khuon’s contract through 2022. In 1999, the Schaubühne was taken over by what was then a very young and new theater generation led by director Thomas Ostermeier. They’ve gotten a bit older in the meantime, but they continue to deliver exciting productions starring exceptional talents such as Lars Eidinger, Mark Waschke, Nina Hoss and Regine Zimmermann. There are about 50 stages in Berlin attracting an audience of approximately three million each year. There are tops and flops everywhere, but you can count on one thing: exceptionally talented young actors and actresses always share the stage with older professionals in the big theater houses. You can watch the stars of tomorrow still in training, performing on stage at the end of each semester at Universität der Künste (University of the Arts) or even each week, acting in the bat-Studiotheater which belongs to the Hochschule für Schauspielkunst “Ernst Busch”. In the past few years, the Ballhaus Ost and Heimathafen Neukölln have developed into Off Theater venues renowned well beyond their districts’ borders. The F 40 in Kreuzberg also sits firmly within the Off scene with a slate of English and American plays in original language. They share their venue with Theater Thikwa. For nearly 30, the “Thikwa” and Theater RambaZamba have worked with disabled and non-disabled actors to produce moving performances together. The Grips Theater has been around for nearly 50 years, and yet the most famous youth theater in Germany has managed to stave off the cobwebs by keeping their finger on the pulse of themes that directly affect young people. The same goes for the Atze Musiktheater and Theater Strahl, whose intelligent pieces for children and teens have them firmly cemented in the theater landscape. These stages don’t just cater to children and youth theater, but also represent today’s popular theater; in close proximity to Berlin’s daily life and even closer to their audience. Culture is not merely a side-note for Berlin’s senate, even if the cultural senator’s duties were dovetailed into the mayor’s job description for ten years (to save one senator’s salary). Since the House of Representatives vote in 2016, Berlin once again has a senator in Klaus Lederer whose job is to handle cultural issues full-time. Lederer strives to improve the precarious financial situation most artists find themselves in. He’s more adamant than his predecessors about the importance of decentralized cultural work that goes on in music schools, adult education centers and district libraries, as well as in youth theaters and throughout the club scene. According to Lederer, Art is being threatened by the expectations “of it being marketable and conforming to norms of saleability. We have the responsibility to both defend artistic freedoms and to maintain infrastructures conducive to creating art that transcends market parameters. We want to create working spaces and increase the number of ateliers. We want to secure production sites and venues for the independent scene, and we want to ensure that there’s a basic infrastructure in place that welcomes young people to come in contact with and grow with art”. The culture budget of the state of Berlin has risen steadily in recent years. This is also due to the Federal Government and the Bundestag, which set a good example. During the past years, the federal politicians have helped Berlin out of its financial troubles time and again by taking over the financing of institutions like the Akademie der Künste, the Haus der Kulturen der Welt, the Jewish Museum Berlin or large building projects, such as the restorations of the Staatsoper and the Staatsbibliothek. This economically weak city would not be capable of financing so many museums, theaters and festivals on its own. According to the constitution, the federal states are responsible for culture. However, Berlin being the capital poses an exception: it does not only represent Berliners, it represents the entire nation as a whole. From a foreign perspective, Berlin is considered to be the showcase of the entire country of Germany. Consequently, it is not in any Federal Government’s interest to see some highly regarded Berliner cultural institutions close down or dry-out financially. You would actually expect to find contemporary Berliner art at the Berlinische Galerie or the Hamburger Bahnhof, the National Galerie’s “Museum der Gegenwart”. Until recently, rather than promoting Berlin’s artists, the Hamburger Bahnhof preferred the big collectors who brought high-caliber contemporary art for which there was no acquisition budget. That’s why the private collections Marx and Flick dominate the museum. Since 2009, when Udo Kittelmann took over the direction, a fresh spirit of innovation has been coursing through Hamburger Bahnhof. He has gone to great lengths in making the museum more attractive to families and to Berlin’s cultural scene. There is hope for the Stadtmuseum since Dutchman Paul Spies was hired as its director in 2016. He was granted 65 million euros in order to renovate the Märkisches Museum. Additional exhibition space is to be created in the neighboring Marinehaus. Spies is experimenting with new exhibition formats to make the house more attractive to the city’s residents and tourists alike. The comparatively well-to-do Stiftung Preußischer Kultur­besitz was for many years the envy of the city’s other cultural institutions: the Stiftung surprisingly received a 200 million cash infusion from the Federal Government in 2014 in order to solve some of their most pressing issues: for one, the Neue Nationalgalerie at the Kulturforum has too little exhibition space, especially for classical modernism. They have been closed to the public since the start of 2015 due to several years of renovations. Thanks to the Federal Government, there’s at least money for the much anticipated Museum der Moderne for 20th century art. They intend on building it next to the Neue Nationalgalerie at the Kulturforum. The winning entry of the competition for best architectural design (by star architects Herzog & de Meuron) reminds of a huge barn but remains highly controversial. In the years to come, small portions of their early 20th century art collection will be on display at changing locations, mainly in the Neue Galerie, located at Hamburger Bahnhof as a temporary solution. At Schlossplatz, Berlin’s most ambitious cultural project, the Humboldt-Forum, has reached the next stage of construction now that the foundation has been completed. The Stadtschloss, which was heavily damaged during the Second World War and dynamited following orders of GDR-leaders in 1950, has been rebuilt as a modern cultural palace with a baroque façade. This former Hohen­zollern residence was transformed into a museum already back after the end of the Kaiserreich Empire during the Weimarer Republic. The former East-German Republic established a multi-functional cultural center in the Palast der Republik inaugurated in 1976, in which the GDR-People’s court resided as well. However, this was first and foremost “Erich’s (Honecker) lamp store”, a popular venue for concerts, shows, small artistry, exhibitions and gastronomy. In 2008, the last asbestos-infested relics from this prominent GDR-symbol finally disappeared from the face of the earth. 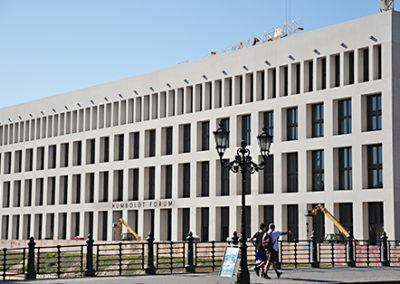 The Bundestag (House of Represen­tatives) decided to rebuild most of the façade and establish a Humboldt-Forum in the building. The conceptual design of Franco Stella from Italy, who was able to win the architectural competition, is closely following these guidelines. The name Humboldt-Forum brings to mind the cosmopolitan brothers Wilhelm and Alexander von Humboldt. While the former was leaning towards the humanities, the latter had a strong affinity for the natural sciences. 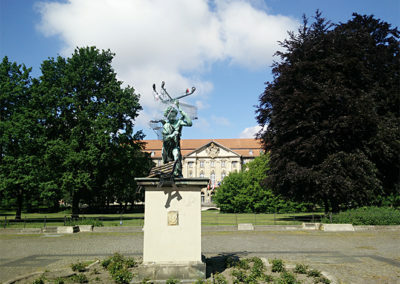 The ethnological collections of the Stiftung Preußischer Kurlturbesitz as well as the natural science collections of the Humboldt University will be exhibited in the Humboldt-Forum. In addition, Berlin wants to present itself as a cosmopolitan city in a new exhibition. Wilhelm von Humboldt greatly influenced the modern concept of education while displaying the archetypal personality which develops and grows through commitment to culture. 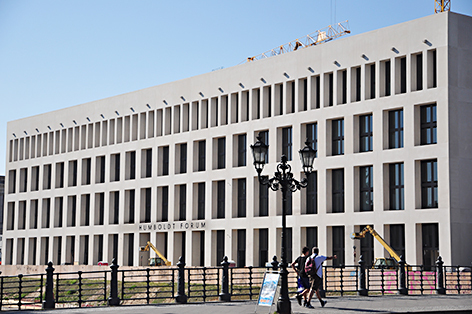 The idea of the Humboldt-Forum is noncontroversial, (as opposed to its architectural expression) because it is casually integrated in Berlin’s general museum history. The very first museum was actually the Royal Treasure Chambers in the Hohenzollern Palace, in which art objects, various specimen and all sorts of exotic things from all over the world were deposited. As an antithesis to the Palace, Karl Friedrich Schinkel conceived Berlin’s first museum building on the opposite side of the Lustgarten: the Altes Museum, completed in 1830. Soon, it became too small. 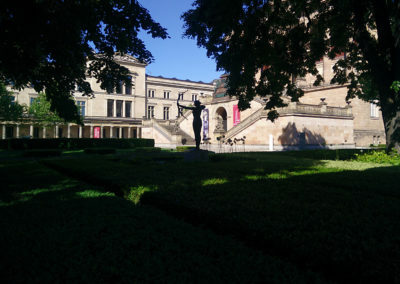 Until 1930, the half-island area behind Schinkel’s art temple was filled by the Neues Museum, the Alte Nationalgalerie, the Bode-Museum and the Pergamon museum. 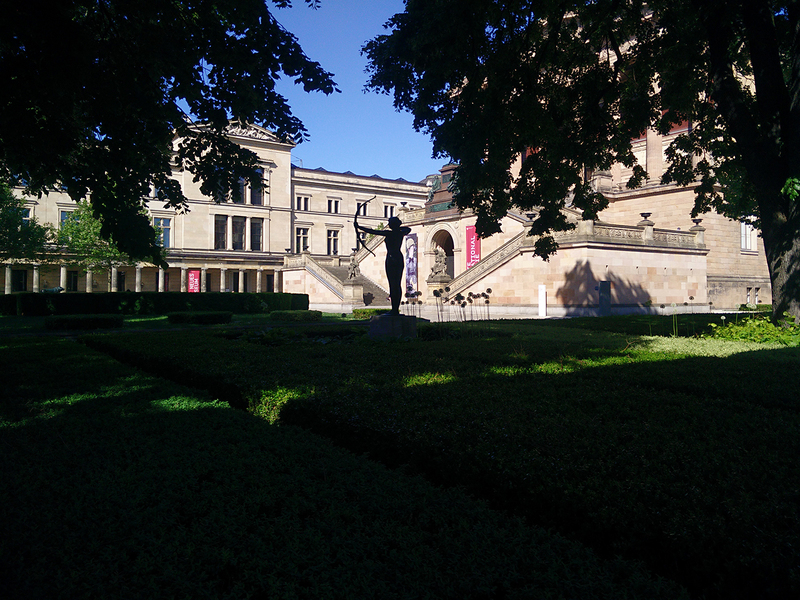 Today, the Museum Island is included in the UNESCO World Heritage and is one of the city’s strongest tourist magnets. The renovations and new furnishing of each house, which began after the reunification, are expected to drag on until 2025 and cost at least 1.5 billion euros. Construction of the new entrance building at the Kupfergraben, the James-Simon-Galerie, was late to start in 2013, because the marshy subsurface had once again caused a massive delay and an enormous budget deficit. In 2019, the new entrance to the Museum Island was completed. British architect David Chipperfield was entrusted with the planning after his splendid success in creating an exemplary symbiosis of old and new in the reconstruction of the Neues Museum, which was completed in 2009. Pertaining to space and substance, Frank Stella’s Humboldt-Forum will expand the Museum Island with the cultural heritage of non-European countries and the natural sciences. This ambitious plan is aspiring to create a kind of “Berlin Louvre” right in the middle of the city; a universal museum that shares the cultural history of humanity since antiquity. 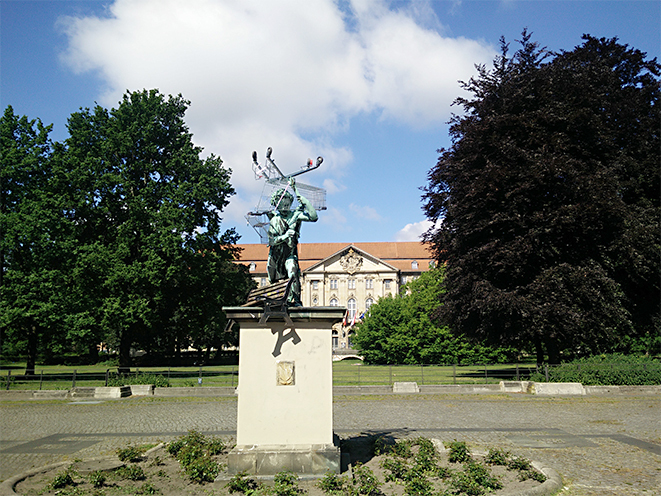 Since the end of the Middle Ages, the palace had always been the power center of the city until the last Kaiser abdicated in 1918. Thanks to the cultural treasures which the Prussian kings and emperors had amassed, there was no vacuum left behind. In the future, the cultural resplendence should be enhanced with the expansion of the Museum Island and with the Hum­boldt-Forum. From there, only a few steps will lead to the Staatsoper, to the Deutsches Historisches Museum, to Humboldt University and to the imposing Staats­bibliothek Unter den Linden. The City Center as a treasure chamber, as a place of beauty, as a forum for discussion and a place for cultural education: this is the vision Berlin is building towards.